Seeing beautiful fresh greens at the grocery store makes me happy. I’m not a rabbit nor a deer, but taking a look at them makes me feel alive. They are appetizing to me. I know I am weird in some ways and my kids think I am crazy, but deep green vegetables are always enticing to me. 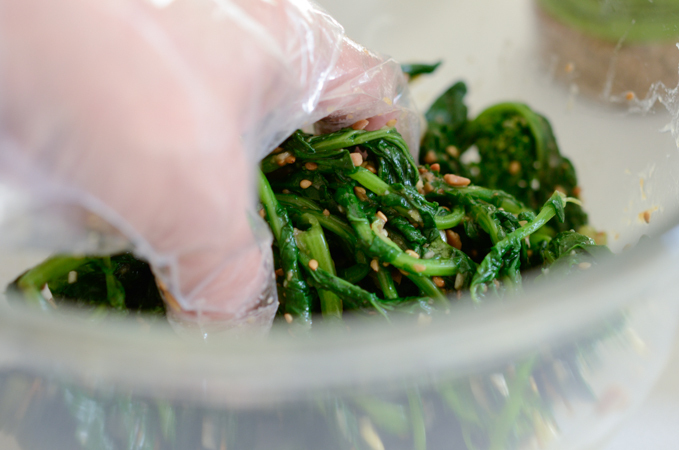 When I saw bunches of broccoli rabe, I knew I had to make broccoli rabe salad with soybean paste to add a Korean twist. 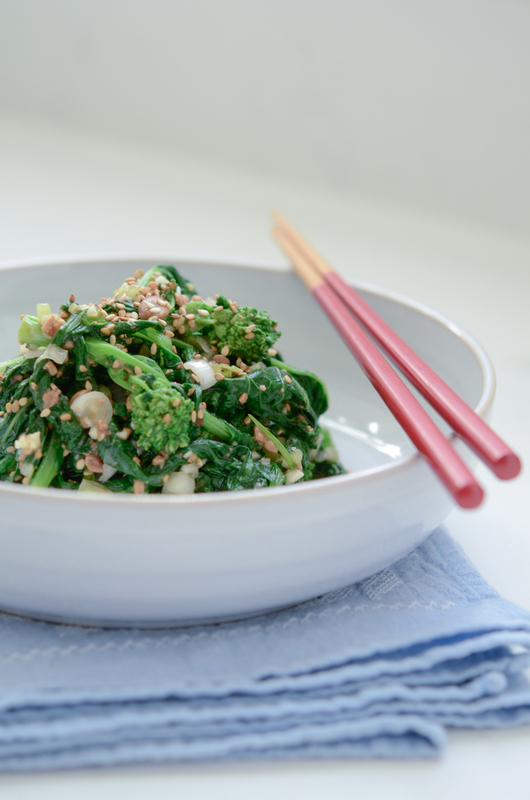 Of course broccoli rabe is not Korean vegetables, but they make a great Korean side salad. Broccoli rabe is somewhat bitter on the taste. However, with robust and pungent flavor of the Korean soybean paste, the grassy bitterness of this beautiful green becomes tasty bitter, if that makes any sense. Make sure you blanch them in boiling water with some salt. That will get rid of some of the bitterness. This is one might healthy salad with low in fat and sugar. Serve them with rice and you are good to go. So here is a bunch of broccoli rabe. 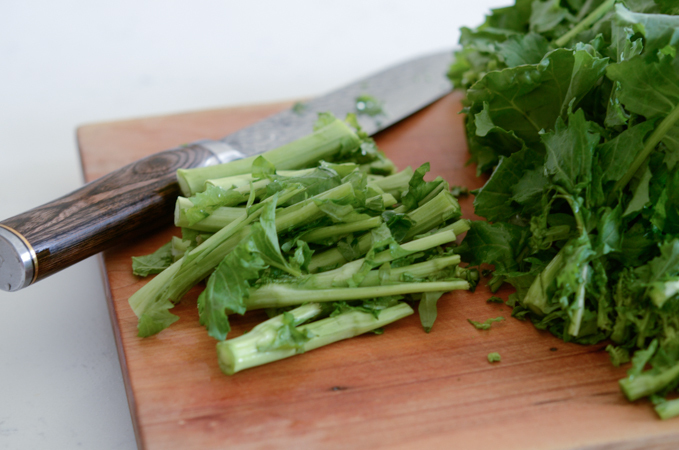 You will want to chop off the fibrous part of stems. Blanch them in salted boiling water for 10 seconds. Drain and rinse with cold running water. Squeeze out the excess moisture. Korean soybean paste is a must condiment in Korean cuisine. While the fermented soybean offers healthy benefit of good bacteria in our body, those good bacteria can’t survive in the heat. Therefore the best way to absorb the nutritional benefit is by eating it raw. Hence using in this type of salad is a great way to gain the health benefit. Toss them together with hand incorporating the sauce and the broccoli rabe. Drizzle more sesame oil at the end if you wish. This is my green goddess salad and it is delicious. I was able to empty out a bowl of rice in no time; tasty, light, healthy, and delicious! Besides, this broccoli rabe salad is a perfect vegan/vegetarian dish. So grab a bunch and try out. It is a feel good food at its best. 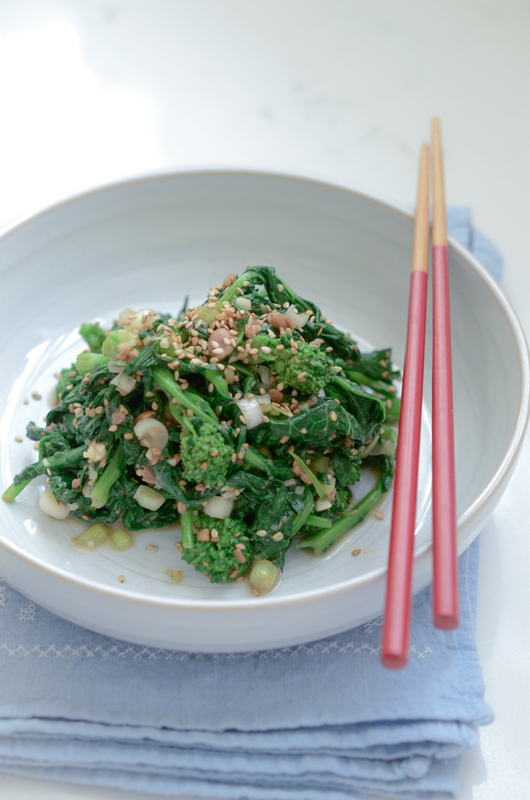 Blanched broccoli Rabe tossed with Korean soybean paste sauce. 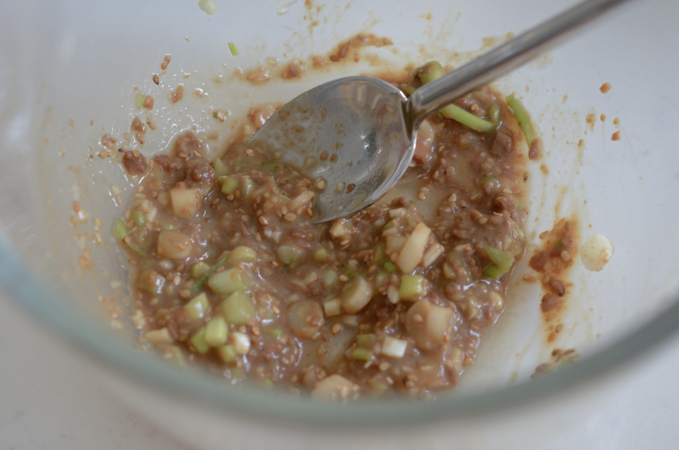 With the robust and pungent flavor of soybean paste, it is great to serve with a bowl of rice. 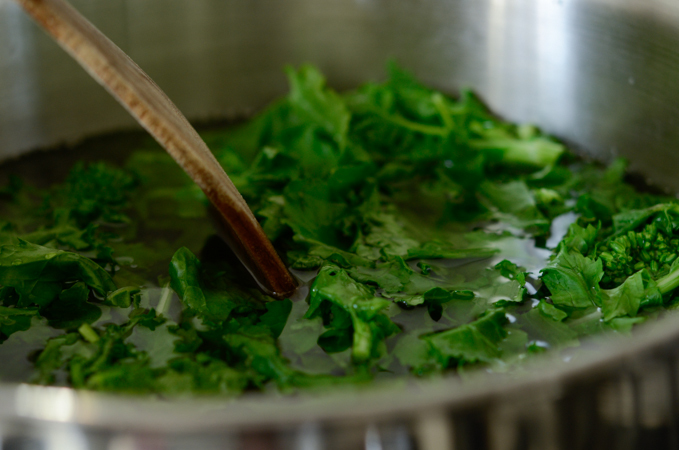 Blanch broccoli rabe in boiling water with some salt for 10 seconds. Drain and rinse under cold water. Squeeze out the excess water and set aside. In a mixing bow, combine the rest of the ingredients and mix well. Add the broccoli rabe and toss with had to incorporate the sauce with the greens. Serve at room temperature or chilled. Oh this is beuautiful! i love the Korean soybean paste. what a delight! Yup, big fans of dark greens here, too. Can't get enough of them! Never used soybean paste with them -- nifty idea. Thanks! Glad to find someone with similar taste bud. Dark greens are great, right? Thank you for sharing this. 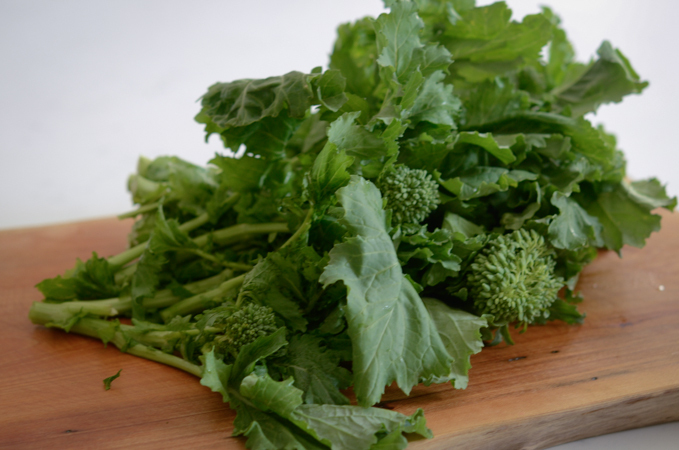 I see broccoli rabe at the market and I want to eat it. But when I cook it - stir fry - it is too bitter. I am looking forward to trying this recipe. Your rabe looks so good. I love your simple vegetable dishes. I'm eating less meat these days but love rice. Your meatless side dishes go well with a hot bowl of rice! Thanks, Susan. Korean vegetable dishes are great for meatless meal. Hope you can try this salad to enjoy with rice. It is very nice.